I moved into a new apartment in Baltimore and started drinking early with some friends to celebrate. Needless to say, I forgot I parked my car in a small alleyway to move my things in through the backdoor. 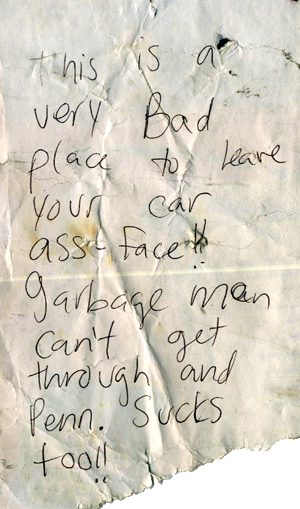 I woke up the next morning with this note on my car, which has a Pennsylvania license tag, and realized that the trash men indeed could not possibly get through, but rather laid on the horn for an hour or so.